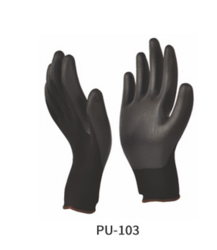 Prominent & Leading Manufacturer from Mumbai, we offer pu coated knitted gloves, esd pu coated knitted gloves, anti static pu coated knitted gloves and pu palm coated glove with nitrile dots. 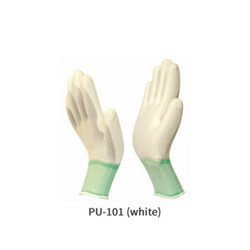 Being a quality oriented organization in the industry, we are focused on offering our clients the best quality collection of Anti Static PU Coated Knitted Gloves. These products are crafted utilizing high-quality fabric and coated with PU which is flexible, synthetic material with outstanding dexterity, sensitivity, grip & breathability. Apart from this, we offer these products in various sizes. 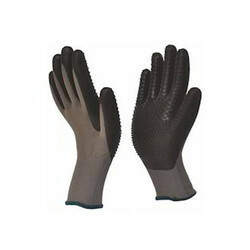 Light weight Nylon or Polyester Knitted Seamless Gloves combined with unique polyurethane Palm Coating. Ultra thin gloves made on 15 or 18 Gauge Liner. Stretch filament yarn offers lint free for less risk of contamination, high sensitivity & lighter construction of the gloves offering greater dexterity for most tactile applications. Open back for excellent breathability & snug fit for lesser hand fatigue. Smooth Grip & improved abrasion resistance for longer use & durability. PU is flexible, synthetic material with outstanding dexterity, sensitivity, grip & breathability. It has good resistance to abrasion & tear. Beside it is ultra light coating, it is also micro porous & hence PU Coating on seamless liner can evaporate the perspiration & eliminates any sort of discomfort for long usage. 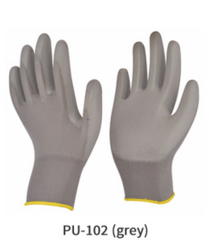 With our decade of experience in the industry, we are presenting a quality array of PU Palm Coated Glove with Nitrile Dots to our customers. Our offered assortment of the products is available in various sizes. These products are designed by using finest quality input factors in order to meet the customer’s diverse requirements. Also, these products are used in Precision work & assembly, Logistics & Warehousing, Small parts handling and Inspection. Light weight Nylon with Spandex Knitted Seamless Gloves combined with unique breathable polyurethane Palm Coating on palm with Nitrile Dots on palm for a better grip. Ultra thin gloves made on 15 or 18 Gauge Liner. Stretch Nylon with Spandex offers excellent flexibility, dexterity & minimum hand fatigue without compromising the purpose. Open back for excellent breathability & snug fit for lesser hand fatigue. Looking for “PU Coated Knitted Gloves”?